One of the primary methods of tube bending along with rotary-draw and compression. Technically press bending, sometimes called vertical bending, is distinguished from these other two methods by the fact that when the ram die (analogous to the bend die in rotary-draw bending) pushes the tube through a pair of wing dies (analogous to the pressure die in rotary-draw bending), two lines of tangency form following the points of contact between the circumference of the ram die and each face of the two wing dies. Press bending is less expensive and faster than rotary-draw bending. Its primary disadvantage is reduced bend quality. 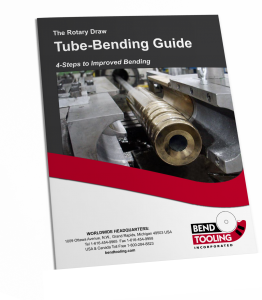 Because the lines of tangency in press bending move through space, as opposed to the fixed single line in rotary-draw bending, it is not possible to fixture mandrel tooling inside the tube nor wiper tooling outside of it to control the flow of material at the two resulting points of bend. Therefore, press bending is only suitable for those applications with relatively heavy tube walls and large centerline radiuses. One exception is if the application allows for a crush bend. If so, then the ram die can be equipped with a “crush knob” which will force the intrados of the tube to stretch around it to mitigate wrinkling. However, this will not reduce flattening of the extrados, especially as the diverging lines of tangency move further out along the circumference of the ram die.